The Insurance 411 is a new Smart’s Publishing project. The Insurance 411 will serve all types of insurance buyers, business and personal, by providing useful, impartial and up-to-date information on any kind of insurance. The Insurance 411 will serve the needs of insurance buyers in other ways. Your clients and prospects will be able to turn to The Insurance 411 for current, curated news and a selective directory of respected, professional agents and brokers. Many of the insurance buyers who find you in The Insurance 411 Directory will be looking for an agent after reading insurance content on The Insurance 411. They will choose you based on the insurance categories in your listing, the locations you choose and what you say in your profile. Your listing will also come up in search engine queries based on your location and keywords. DETAILED LISTING: Your listing includes almost as much detail as you want to provide: contact information, social media links, photo, personal profile, service areas, products you sell, your target markets and more. 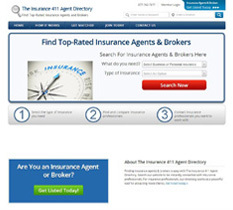 SEO BENEFITS FOR YOUR AGENCY WEBSITE: Listing your agency website in The Insurance 411 Agent Directory will help you improve the link quality of your website. An important factor used by search engines to determine domain authority is the number and quality of back links to a website. The quality and relevance of The Insurance 411 will have a positive impact on your search engine rankings. MODERATED LISTINGS: Our mission for The Insurance 411 is to build a resource for insurance buyers. Insurance buyers who trust the content on our website will also trust the listings in The Insurance 411 Agent Directory. Therefore, we are extending invitations only to preferred agents who are our customers and members of groups such as NAHU, NAIFA, IIABA and other professional organizations. COST-EFFECTIVE ADVERTISING: At no or low cost, your listing in The Insurance 411 Agent Directory is your best advertising value. MOBILE-FRIENDLY: The Insurance 411 Agent Directory, like The Insurance 411, is designed to be mobile-friendly. If you’re an agent who would like to take advantage of these benefits, click this link to start your FREE listing. On the left you’ll find a button for agents to Get Listed Today! Click on that and get started with your listing. You’ll see a green box that says Create Listing under each membership level. Select either the free listing or any of the enhanced membership levels. As soon as you fill in your email address and create a password, you’ll get an email confirmation. Open the email and click on the link. Then provide as much information as you want in your listing. Don’t worry about including everything now—you can always update it later. You just need to get started. I hope you’ll take advantage of this opportunity to be on the ground floor of what should be an exciting business-building opportunity for you and your agency. If you have questions, please contact me. What To Do After Your New Website Goes Live? Answer: start working on your search engine optimization. After all, you want to get your website ranked near the top of all the relevant search terms so people can find you. One way to build a solid SEO strategy is to associate your website with as many keywords relevant to the kinds of insurance you sell as possible. A great way to do this is to write a blog using all the important insurance keywords that show up in searches. It’s a lot of work, but it pays off. Another simple and very effective way to increase your search engine rankings is to get your website listed with as many directories as you can. You want to get listed with Google+, Facebook, etc. of course, but don’t ignore providers of local directories, such as yellowpages.com, Yelp! and others that can drive insurance business to you. Want to know which directories you should get listed on? https://getlisted.org/ is a great resource. Just enter your business name and ZIP code and in seconds you’ll get a complete rundown on the found, missing and unclaimed listings for your business. You will also find links next to each listing source, which you can click on to create listings for yourself. The more listings or “citations” you have, the greater your chances are of being top-ranked in the search engines. Getlist.org did a study to determine which citation sources are best for different businesses. For insurance agencies, yellowpages.com, superpages.com and statefarm.com got the top three rankings. Of course unless you’re a State Farm agent, that source will do you no good, but you’ll want to take a look at the rest of the list for tips on which sources to list your new website with, and start driving traffic to your site: https://getlisted.org/static/resources/local-citations-by-category.html#InsuranceAgencies. By the way, as you progress in your efforts to increase your listings you’ll want to check the Listing Score posted for you on getlisted.org, which is located in the upper right corner above your results. And one more thing, if you’re using a domain name that’s not the same as your agency name, Google, Bing and Yahoo probably won’t know who you are, which means it’s going to be hard to get these directories to even recognize you. If this is your situation, the first thing you need to do is submit your new website directly to Google (http://www.google.com/submityourcontent/), Bing (http://www.bing.com/toolbox/submit-site-url) and Yahoo (http://www.ehow.com/how_4770781_submit-website-yahoo.html). Last time I wrote about the importance of using Google Places to improve your insurance agency’s chances of being found on the Internet. Even if you don’t have a website, you can still use these search tools to optimize your Google Places listing. In addition to writing about your service, reviewers can rate it with stars; five stars are max. Frankly, I haven’t seen a review yet that wasn’t five stars! By the way, once someone has written a review for your Google Places listing, the words “Place page” are replaced with “n Google review(s)” (where n equals the number of reviews posted). Besides helping your rankings, shoppers are obviously going to be more attracted to listings with reviews, so the more the better. Yahoo Local. (http://listings.local.yahoo.com) You’ll provide much of the same information here as at Google Places. This listing is free, but for $9.95 per month you can get Yahoo’s Enhanced service, featuring more room for your company description and tagline, more photos, and analystics on the number of times your listings are viewed and clicked. You also get “Maximum Exposure Placement,” which makes “your listing more discoverable to web searchers.” Even though only about 15% of searches are done on Yahoo (as compared to about 72% for Google), Enhanced service might be something to try out at some point. Angie’s List. (http://angieslist.com) Another aggregator of consumer service reviews, Angie’s reviews also get posted to Google Places. Currently 1.5 million people subscribe to Angie’s List and they post about 45,000 reviews per month. Compared to Google and Yahoo, these aren’t big numbers. But since subscribers pay to belong, they probably consider what they say in their reviews a little more seriously than those found on free sites. In other words, they matter. The cost to businesses is nothing, so it can’t hurt to join. Ibegin: (http://www.ibegin.com/business-center/submit/) Focus is on business listings. They claim over 1 million searches per month in US and Canada. InfoUSA: (http://lp.infousa.com/) Vendor claims 85% of online directories are powered by InfoUSA, including MSN and AOL brands and 90% of in-car navigation. Insider Pages: (https://signup.citygrid.com/) Like Yelp and those that follow in this list, an aggregator of consumer reviews. Ranks agents by number of stars assigned by reviewers. Local.com: (https://advertise.local.com/) Free, but like many directories here, “enhanced listings” (that is, paid listings) get preferred placement. Merchant Circle: (http://www.merchantcircle.com/signup) My search experience on this site is that they are heavily weighted with ads and search results are minimal. But, hey, it’s free. Yelp: (https://biz.yelp.com/support/unlocking) Fastest growing website of its kind; has more than 54 million unique visitors. You can have the best website, the best service and products, but if people can’t find you in today’s electronic version of the Yellow Pages, you’re losing a lot of potential business. Website-ready or not, you owe it to your success to get into these directories, especially Google Places. The site design is professional and tasteful. The use of different shades of blue in fonts, graphics and backgrounds reminds me that the most popular corporate identity color in the insurance industry is blue. But it’s handled well here, with lots of white space and some nice stock photo choices. The overall effect is soothing. The fonts, graphics and layout are attractive and readable. I’d like to see bullet points break up the text now and then and using sub-heads would help to move the reader along, but the writing is clear, the sentences and paragraphs are short and the photos that accompany each article nicely punch things up with a little visual interest. It’s also well integrated into the rest of the website, which has several calls to action, especially contact requests, on every page — though it’s strange not to see a place to sign up for their insurance blog or any quote request forms. Location, location, location. But the main thing I like about this site is the way the agent has drilled down the focus of his topics to the locale. He doesn’t just write about health insurance for individuals, he writes about “Health Insurance for Individuals in Illinois.” He writes about “Illinois Health Savings Accounts” and “Illinois Health Insurance Pre-Existing Conditions” and “Choosing Health Care in Illinois.” In fact, every headline has Illinois in it! Do you think he’s on to something here? I think this is a great idea for a couple of reasons. First, people care about the particular more than the general. It’s one thing if a storm front is passing through the Great Lakes. Okay, but what I really want to know is how the storm is going to affect me in Chicago, if that’s where I live. The other thing this agent is accomplishing with all his Illinois-centric posts is he’s climbing up the ranks on all the search engines. I did several searches in Google using words from the titles of his articles, such as Illinois Medicare insurance and Illinois health care. His agency came up on either page 1, 2 or 3 every time. I see that his first positing was on June 1, 2011, so this is a very young blog. Chances are excellent that as he posts more and more, in time many of his posts will move into one of the top five positions on Page One in many of the search engines. This agency is obviously tuned into the concept of search engine optimization. Not only is this insurance agency blogger savvy about his blog posts, but look at the name of the agency. It’s Health Insurance Services, but their domain name is www.insurancebrokerillinois.com. If I’m looking for an insurance broker and I live in Illinois, what are the odds I might use the terms in their domain name for my search? If you’re an agent with an insurance blog or there’s an insurance blog you think is interesting for any reason, please let me know. I’d love to take a look at them. Some experts discourage using dashes in domain names, as in insurance-for-homeowners.com. They say that names with hyphens are hard to remember, hard to type and hard to verbalize when you tell people the name of your website. But hyphenated domain names are abundant and the good news is that search engines have no problem with them. They don’t even pay attention to the dashes. To see if a name is available, go to any of the domain name registrars such as GoDaddy or 1&1. Many other websites will do searches and help you create a domain name. One site I like is called DOM!ZE (https://domize.com/). When you type in a domain name, you instantly see the availability status of what you’re typing and which of the most popular extensions (or TLDs, top level domains, as they are also called) are available: com, net, org, biz, us. Also, when you hover over the extension names (TLDs), you will see a quote balloon that gives you the prices for that domain as offered by several of the leading domain name registrars (GoDaddy, 1&1, dotster and networksolutions). If you feel you must have a certain name that is already taken, you might be able to purchase it. Domainr (http://domai.nr/), among others, will tell you if a name is taken and put you in touch with a broker who will help you negotiate with the domain owner. If the name is being actively used by an entity, they are likely to want a lot of money for it. On the other hand, if a domain name is registered but not in use, you can backorder it and if the owner does not renew the name, it’s yours. When creating the rest of your website, make sure it’s friendly to search engines by keeping the language simple. For instance, use “centralcitylifeinsurance.com/coverages/life/quotes” and not “centralcitylifeinsurance.com/17/bin/aprsd12/qte32.php.” The search spiders cannot help you if your site is organized with this kind of language. Keep in mind that once you’ve purchased a domain name, you are not locked into to using the provider who sold it to you. You own your domain and can transfer the hosting to any provider you wish. Your domain name is sort like your trademark. It’s yours to delegate as you see fit.